It looked like a lovely day for batting - it turned into rather a good one for the bowlers. It was the bowlers who dominated on a fluctuating first day at the Arundel Castle ground where Clint McKay’s four wickets gave Leicestershire hope that they can win their first game of the season in the Specsavers County Championship. The wholehearted Australian fast bowler picked up 4 for 59 in the heat as Sussex were bowled out for 262 and appeared to have squandered the advantage of winning the toss in front of a crowd of more than 2,000. 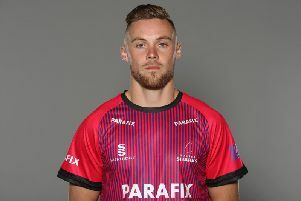 But a two-paced pitch, which is expected to turn, gave seamers assistance all day and Sussex’s new ball pair Chris Jordan and Jofra Archer each picked up one of the Leicestershire openers as they closed on 77 for 2. It was a day to remember for Leicestershire’s 19-year-old debutant Will Fazakerley. Guernsey-born but educated just down the road from Arundel at Lancing College, he claimed his maiden Championship wicket when he had Jordan lbw for 34. Jordan was one of several Sussex players who got starts without pushing on. Eight of their batsmen got to 20 but only South African Stiaan van Zyl, who top scored with 49, looked capable of dominating a persevering Leicestershire attack. Van Zyl shared in a fourth-wicket stand of 62 in 12 overs either side of lunch with Luke Wright, whose first scoring shot for the second successive game was a six. But from 138 for 4 Sussex lost three wickets adding 27 runs. Wright played on to Richard Jones for 25, van Zyl was lbw half-forward to McKay after hitting nine boundaries before skipper Ben Brown drove McKay’s slower ball to cover for 19. Jordan and leg-spinner Will Beer, who took 11 wickets at Arundel last month against South Africa A, put on 54 for the seventh wicket but Leicestershire wrapped up the innings with three wickets after tea, two of them to Matt Pillans. Earlier, Luke Wells had passed 700 Championship runs after being restored to the top of the order. The left-hander lost opening partner Chris Nash (15), who played on to McKay before Harry Finch fell for a golden duck shuffling in front to a ball from Jones which nipped back. Wells and van Zyl briefly prospered together, taking the score to 74 before Wells, who had struck eight fours in a fluent 42, was caught behind off Pillans. By then umpire Martin Saggers was on the pitch, his arrival having been delayed by traffic congestion. Martin Bodenham, who retired from the first-class list last season but lives in nearby Ferring, stood at square leg before Saggers arrived. Sussex’s Stiaan van Zyl (top scored with 49): "The pitch was on the slow side. A lot of our batsmen got in including myself but couldn’t go on which was disappointing. But there is something in it for the bowlers and the aim now is to try and get a lead tomorrow. We picked two spinners because we think it will turn from tomorrow and they could be heavily involved in the game. It was important to get their two openers out before the end. Their top four is strong and after that they don’t have a lot of experience and if we can get an end open early tomorrow we can attack them." Leicestershire’s Clint McKay (took 4 for 59): "It was a great day for us. After losing by three runs to Northants last week we wanted to bounce back and I thought our bowlers did that. It looked a beautiful wicket so to bowl them out for 262 was a great result. We stuck to our plans all day, kept running in and to see Will Fazakerley get his first wicket was a nice moment for him. It was disappointing to lose our two openers but Colin Ackermann and Mark Cosgrove did a good job and hopefully we can get ourselves a nice little first-innings lead. The wicket will turn and go a bit more up and down so it’s important to try and get in a strong position because I wouldn’t want to be chasing too many on the fourth day."